Had a very enjoyable walk in the snow today. 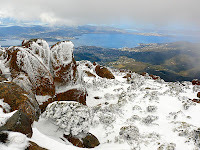 Stared at The Springs and walked to the top of Mt Wellington via the Pinnacle and ZigZag Tracks. There was snow underfoot most of the way, but it was only difficult in a couple of spots part way up the ZigZag. I wasn't too keen on how I was going to get down - my lack of balance on low-friction surfaces is pronounced. Anyway, as I was going up, I realised that as the road was closed at The Springs, then a walk down the road would be quite pleasant. At that point the snow underfoot became thicker, softer, scrunchier and "sticky" so the climbing got easier. There were reasonable views for much of the time, but some cloud was hanging around the summit. When I got to the summit, I had it to myself, no cars, no people. very quiet. I had lunch in the visitor shelter, on my own. As I left, and walked down the road, a Tas Government car came up the hill. It was soon followed by others, but not huge numbers. The walk down the road back to The Springs was certainly easier than slipping and sliding back down the ZigZags. All in all, a very enjoyable walk. 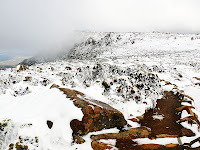 Tasmanian alpine plants are very well adapted to not just the cold, but being regularly covered with snow, uncovered, soaked in freezing rain, frozen again, and being blown around almost incessantly. 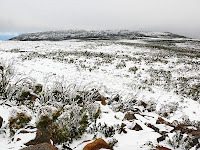 Compared to mainland alpine areas, Tasmanian alpine zones don't have reliable deep snow cover for the winter. It tends to come and go. as a result, the plants in these places are extremely hardy and put up with a lot of abuse from the elements. This is the Kerosene Bush, Ozothamnus ledifolius, (previously Helichrysum ledifolium). The horizontal icicles formed on these plants show just what they have to put up with. 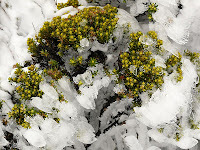 This is an endemic Tasmanian plant and dominates the alpine heath on Mt Wellington. It is also known as the Hepatitis Daisy-Bush. Nice! This comes from the yellow substance exuded by the leaves which gives the plant its characteristic colour. Just to be pernickity. Since they installed it, the diagram of the hills visible to the east and north-east has contained a significant error. Check out the photo of the detail in question. A lump on the left-hand side is labelled as Mt Maria. It isn't, I'm fairly sure it's Mt Freycinet. Whatever it is, it is not Mt Maria. Maria Island can be seen in the distance on the right-hand side, below the words "Midway Point". It's a fairly stylised approximation of the shape of Maria Island, but I think the high point towards the right of the island shape (south) is actually Mt Maria. And don't get me started on the various dates and numbers of years given in the information about the building of the Tasman Bridge. Finally, this view looking towards Thark Ridge made it clear just what a cold and stark place the back of the Wellington Range can be in winter weather.